Two involved are Michael and Nolan Callahan. Michael Callahan was seen in last summer’s featured fundraiser, “Caught in the Net” and comes to the group with an interesting resume. He was a Christian recording artist for many years, opening for top name performers like Amy Grant, David Meece, Twila Paris, Petra, Larnelle and others in venues all around New York, such as the Syracuse Landmark Theatre. For the Oswego Players, Michael appeared as the male lead in “I Remember Mama” and in “Twelve Angry Men” as juror #10. He was one of a cast of four, each actor doing seven to eight roles each, in “John, His Story.” It was performed locally at various venues over a one-year period. Michael has also enjoyed performing with his sons, Nolan and Aaron in a number of Children’s Theatre plays. 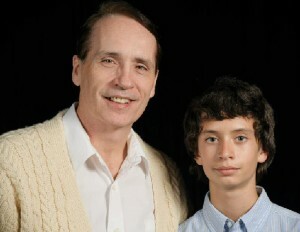 Nolan Callahan is a 12-year-old seventh grader with experience beyond his years with the Oswego Children’s Theatre. Some of his credits include, “The Best Christmas Pageant Ever,” “Peter Pan,” “Flying Colors,” “Alice in Wonderland,” and “The Wizard of Oz.” This is his first show with the Players. Nolan is a credit to the arts community, including acting and All-County Orchestra and Band. He is a 2nd degree black belt, does cross-country, baseball and track and field. He belongs to several school clubs, and amazingly, has a photographic memory for memorizing lines….a talent to be envied by all actors. Performances will take place on the Frances Marion Brown theatre stage in the Oswego Civic Arts Center, Fort Ontario Complex. Production dates are December 7, 8 and 14, 15 at 8 p.m.
A matinee will be performed on December 16 at 2 p.m.
Tickets are $10/adults, $8/seniors and $7/students. Reservations are recommended, and available at the Players’ box office number: 315-343-5138.